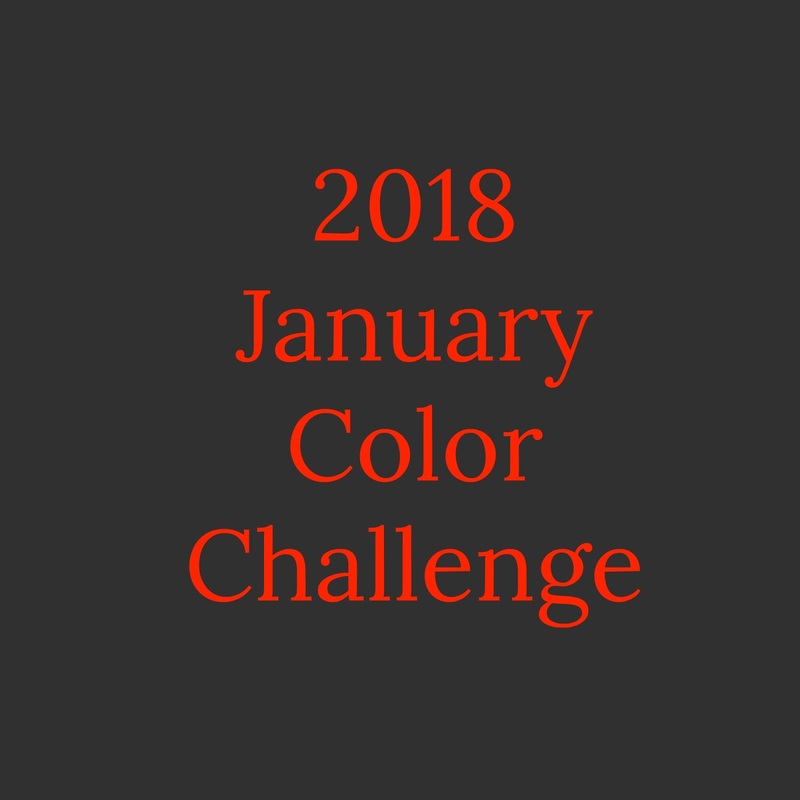 2018 Color Challenge - January is RED! I am SUPER excited to part of this group of quilt designers and bloggers who are participating in the 2018 Color Challenge. In January we are celebrating the color RED! Jen's free block use two shades - light red and dark red. I selected two Island Batik fabrics from my stash that have a nice contrast between them. 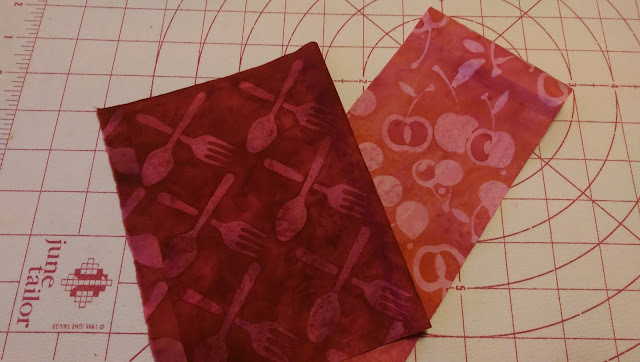 While each of these fabrics have a distinct printed pattern (spoons & forks / cherries), it's interesting to see how the spoon & forks pattern disappears in the finished block but the cherry pattern remains. Next I got all my pieces cut out, organized and ready to stitch. The blocks went together very quickly - so I decided to make one in each size... 12" and 6"
And just as I was finishing up, some fluffy snowflakes started to fall so I ran outside to photograph the blocks on the patio. I can't wait to see what your block look like. 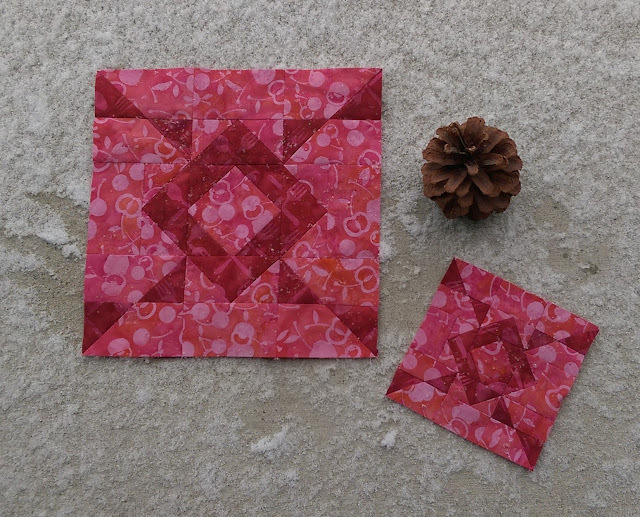 On Jen's blog you have an opportunity to share your red block or anything made with red from January 24 - 31 to be eligible for prizes. 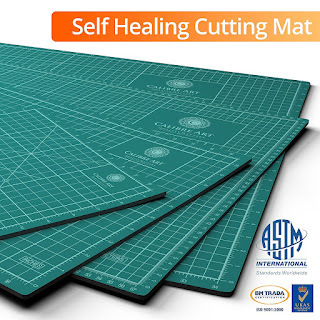 And speaking of prizes, the sponsor for this month is: Northcott Fabrics who is providing this bundle of 2-1/2" precut strips. 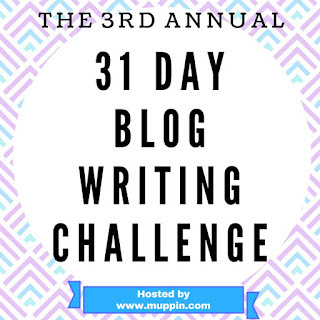 Also be sure to visit the other bloggers who are participating this month. This is always fun to see what everyone is making too! 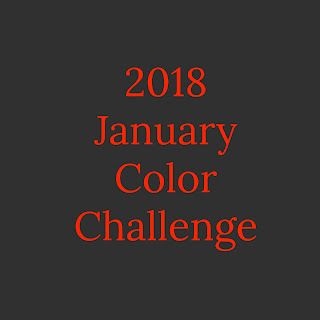 If you are playing along with us, make sure to use #2018monthlycolorchallenge on social media! And speaking of social media, be sure to follow me on IG: @masterpiecequilting and Masterpiece Quilting on FB for sneak peaks and updates. 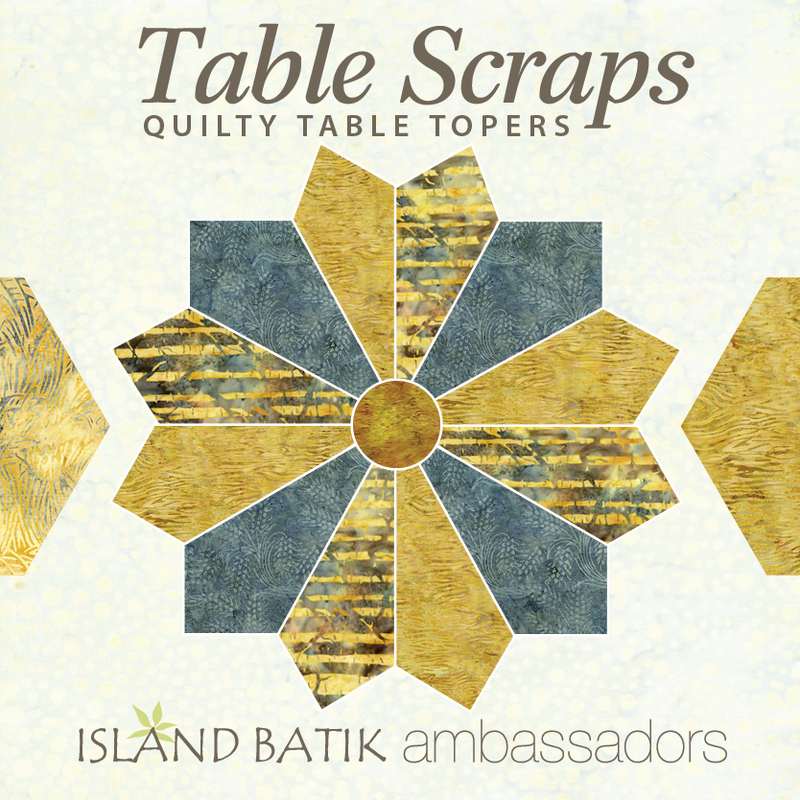 The December 2017 Challenge for Island Batik Ambassadors is a Scrappy Table Topper - the perfect project for this time of year. I find I'm changing out my table more frequently so it doesn't always look the same when guests arrive. 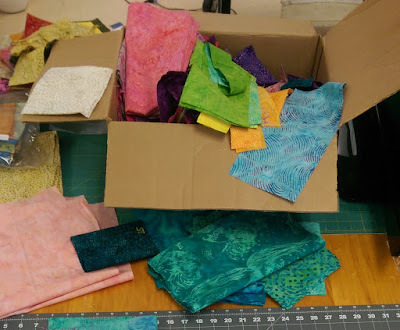 Throughout the year I saved scraps from each of my projects and I had quite the box full! In the process of making this challenge, I also crossed a quilt off my bucket list. I have always wanted to make a New York Beauty quilt and now I can say that I have. In the past I hadn't been a big fan of paper piecing, but I'm starting to really get into. 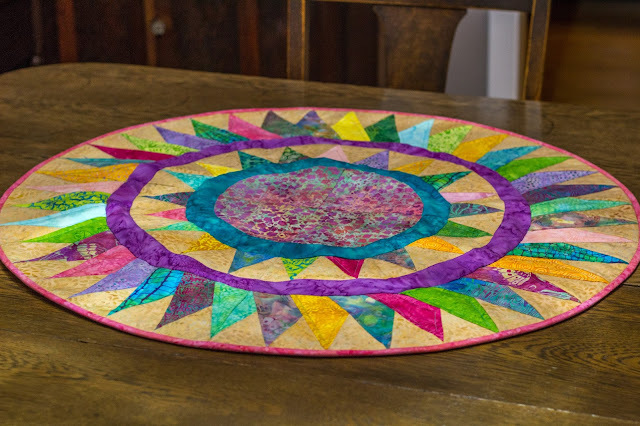 This is the third table topper I have paper pieced recently and I'm so happy with all three of them. My original intent was to make a traditional Christmas themed topper, but I didn't think I had enough reds, greens and golds. But I had plenty of Springy fabrics which worked out better in the long run. Also I quilted this table topper on my domestic sewing machine - which may sound somewhat odd. 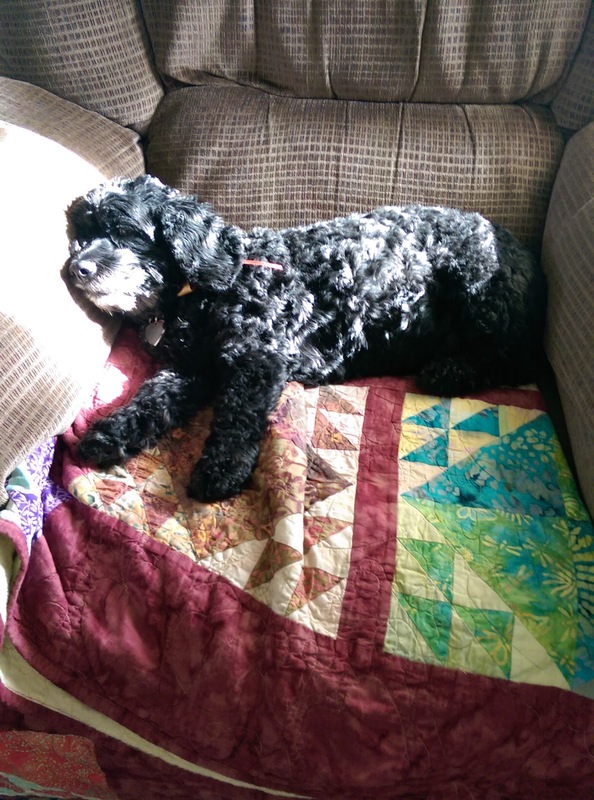 I have a computerized longarm that I do all my quilting on, so I'm a complete BEGINNER at quilting on a sewing machine but I am doing better. Practice is good! I used Warm 80/20 from The Warm Company for the batting and since it is a low-loft batting it worked great. 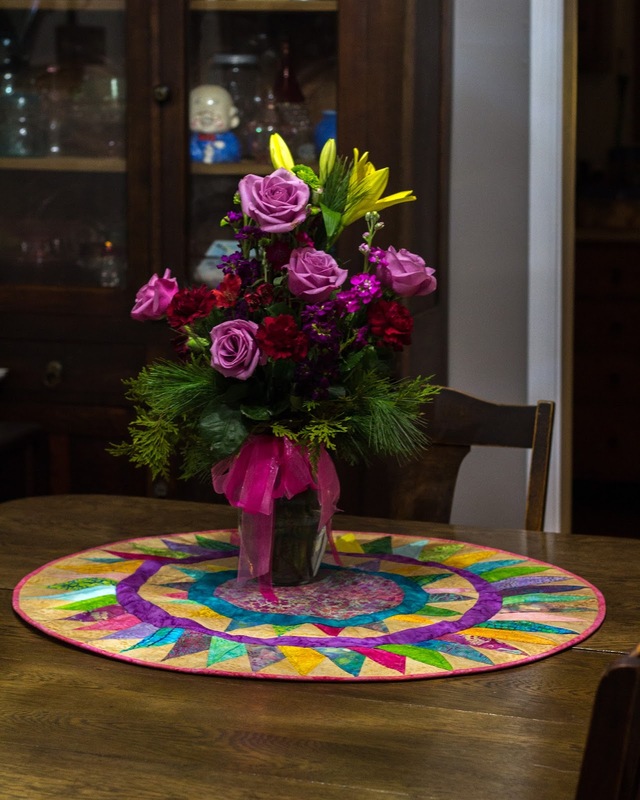 And the best part - I already have a Spring table topper ready for when the Winter décor gets put away! Labels: 2017, Aurifil, batiks, Brand Ambassador, Island Batik, Masterpiece Quilting, paper piecing, The Warm Company. 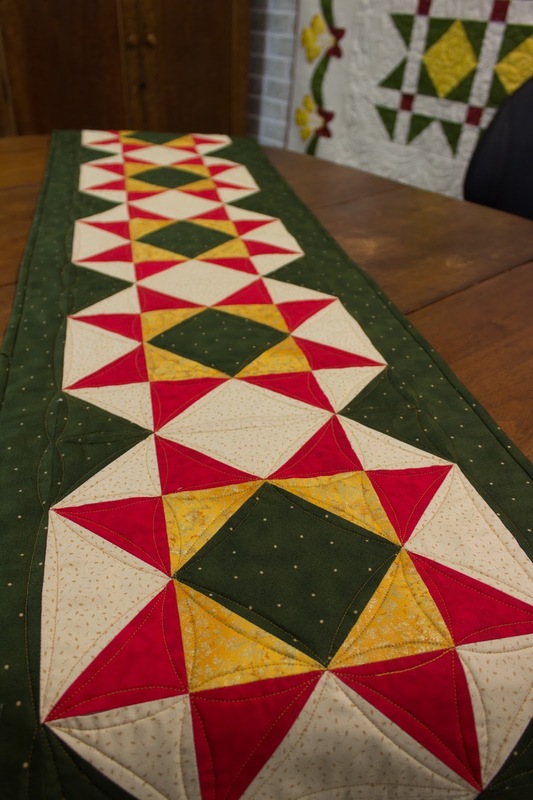 What's a better way to start the new year than with a Quilt-A-Long? 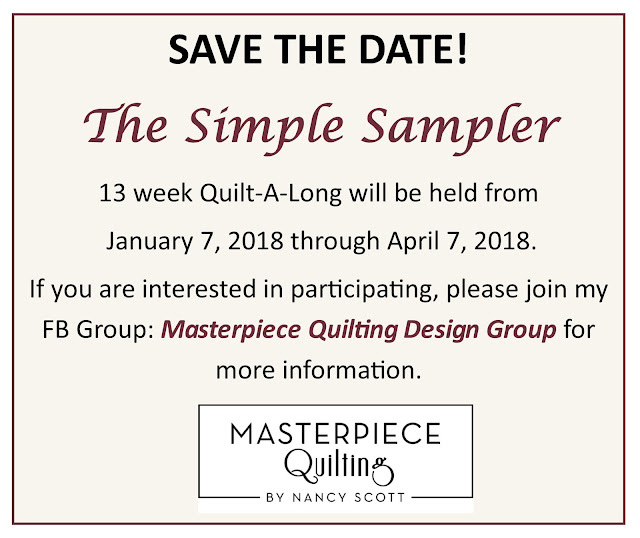 I'm hosting a 13 week Quilt-A-Long (QAL) on my FB Group: Masterpiece Quilting Design Group starting January 7, 2018 and continuing through April 7, 2018. Once a week you will receive instructions for the block we are working on that week as well as either a FB Live (that you can always watch later) or a video for you to learn more about that week's block and some tips on making it. 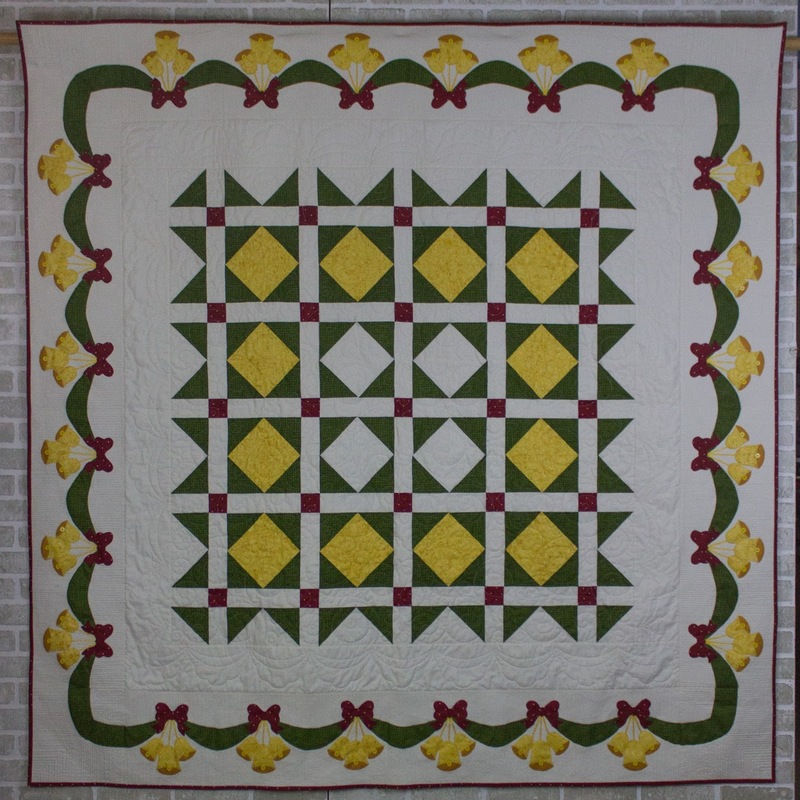 Since this is a sampler quilt, the first 12 weeks will focus on the blocks and week 13 will cover the sashing and borders. All you have to do is stitch along and post photos of your block if you want to share your progress with others and ask questions to get more help. This is a free quilt-a-long and you are only responsible for the fabrics and supplies you need to make the quilt. While the QAL is going on you can download all the files for free. After the QAL is over, I will compile the files together into a full pattern that will be available for purchase. 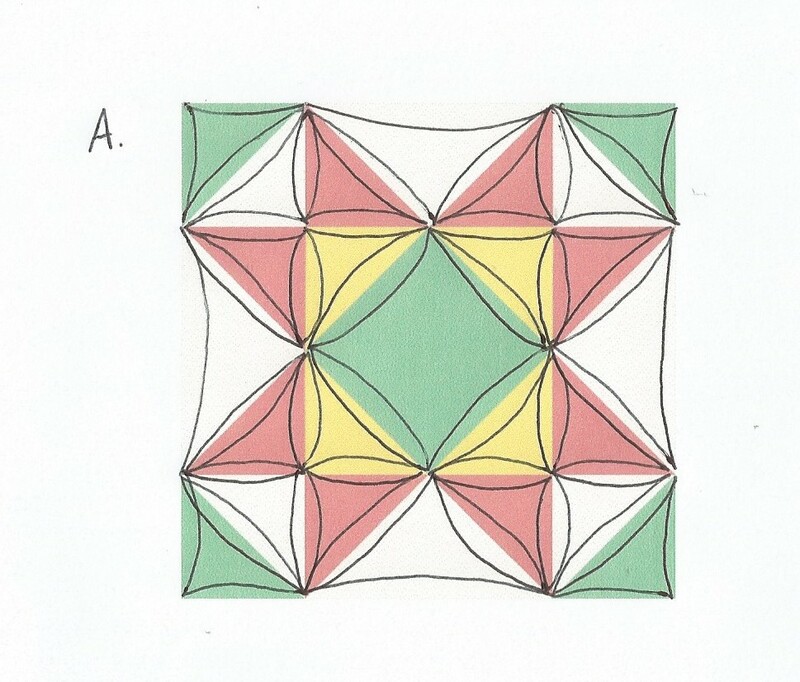 So what quilt will we be making ? It's The Simple Sampler! This is one of my original designs and is the first time the pattern is being offered! 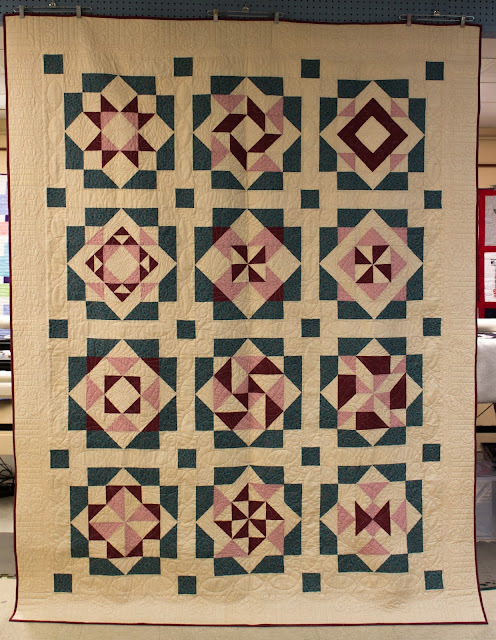 The finished size is 79" x 100" and it is a beginner to confident beginner level quilt. I hope you join us for this Quilt-A-Long - it's gonna be a lot of fun! As I was looking through my blog posts, I realized I have never really introduced myself to you .... so better late than never. I was grew up in Northern Indiana on a farm so my early years were filled with crops, cows and pigs. 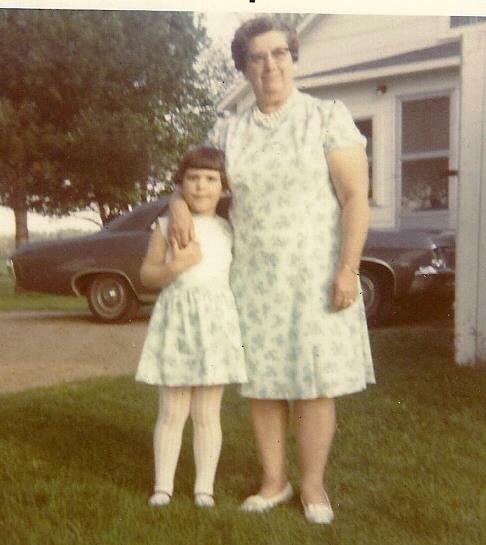 Most of my time was spent with my Grandmother who quilted, crocheted and made most of my clothes including this matching outfit one year for Easter. Being a farm kid, I was active showing livestock and being in 4-H and FFA. This experience allowed me to develop a strong work ethic, taught me time management skills as well as business knowledge I still use today. 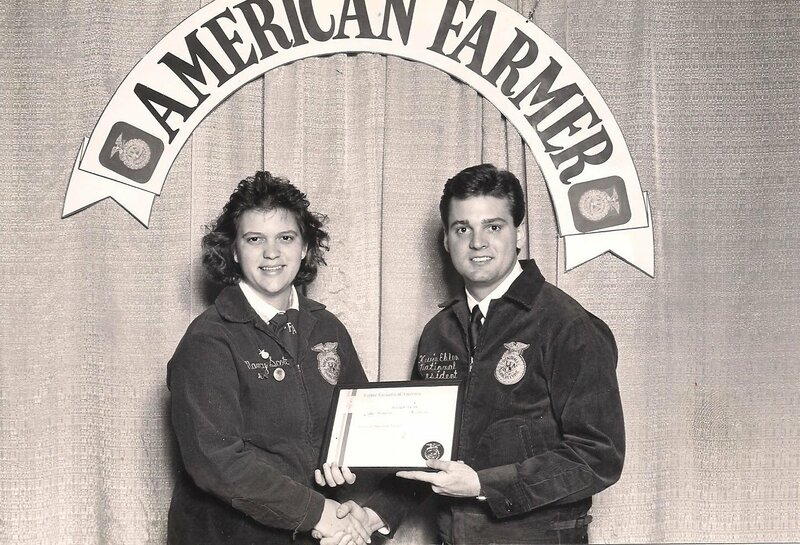 I received the highest member award possible through the FFA which was the American Farmer Degree. Like many farm kids, my goal in life was to become a veterinarian ... but chemistry and I didn't along. So I ended up with a B.S. in Animal Production and a M.S. in Agricultural Economics both from Purdue. I then worked for Purdue for 15 years before starting my own business in 2006 and as they say the rest is history. Today I describe myself as an author, designer and teacher who loves being crafty. Growing up in a family of “makers”, I’m a proud DIY / MIY enthusiast. I always have at least two or three or more projects going at the same time. My current favorites include sewing & quilting, refinishing antiques, chalk-painting and photography. 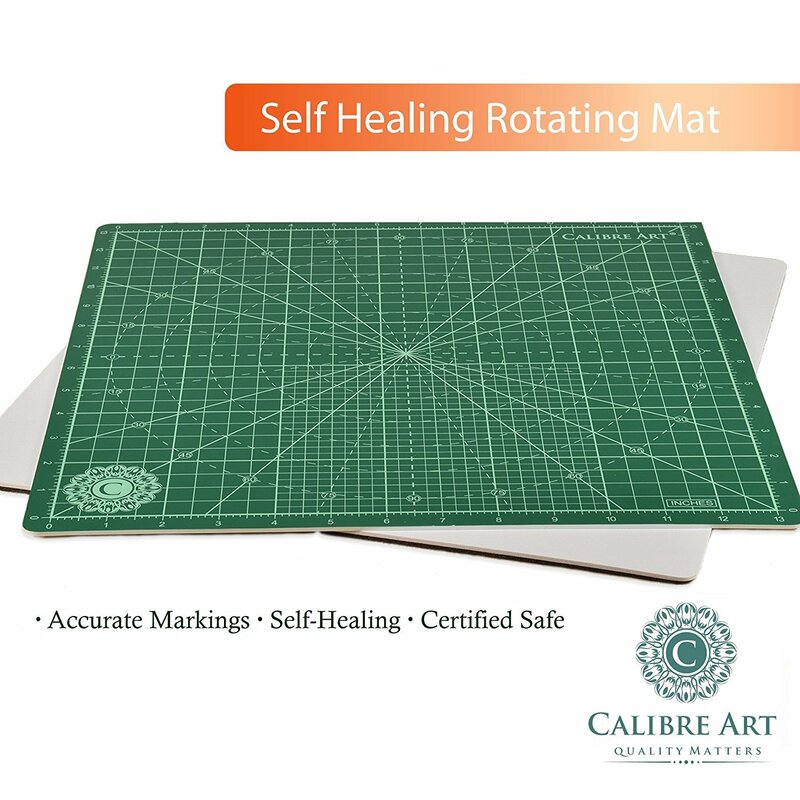 When I changed careers from the academia / corporate world and started my business Masterpiece Quilting LLC where I was a sales representative and certified trainer for Gammill / Statler. 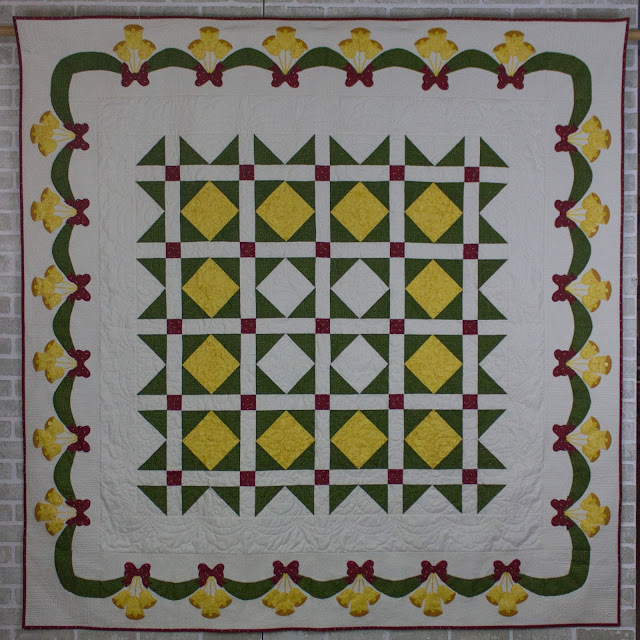 My business evolved to specialize in long-arm quilting, show quilts and custom-made memory quilts. In 2012, I submitted my first design to a magazine for publication. It was accepted and my calling was found that day! Since then I have sold over 50 designs to publications and fabric companies. 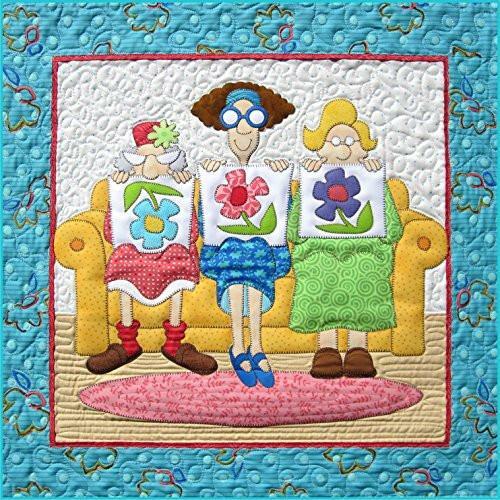 I’ve established myself as a leading author and instructor for creating with sentimental textiles with my top-selling book “T-shirts, Memories & More” along with DVD’s on T-shirt quilting and Restyling Vintage Quilts. I love to doing video work. It bridges so many gaps and let's me teach people 24/7/365 without either of us having to leave the comfort of our studios. 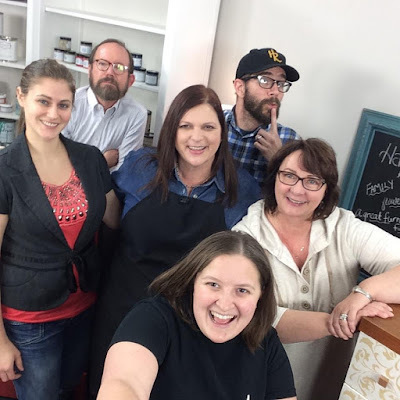 Plus videos are a lot of fun and I get to work with so many amazing people! I would love to learn more about you. Please feel free to leave me a comment about what inspired you to become a "maker". And if you want to keep up on all my crafty adventures, please follow along on Social Media. I'm on IG @masterpiecequilting or at Masterpiece Quilting on Facebook. so when I saw "CHALLENGE", my full attention was captured. and if you are a blogger, consider participating too! I'm mixing things up a little this month with a Thankful Thursday blogpost. It's good to be thankful in life! This week I want to share how thankful I am for technology. WHAT! Technology.... said by the person who manages to hang up on everyone when a second call is waiting and who publicly asks at the AT&T store if they have a rotary dial cell phone! 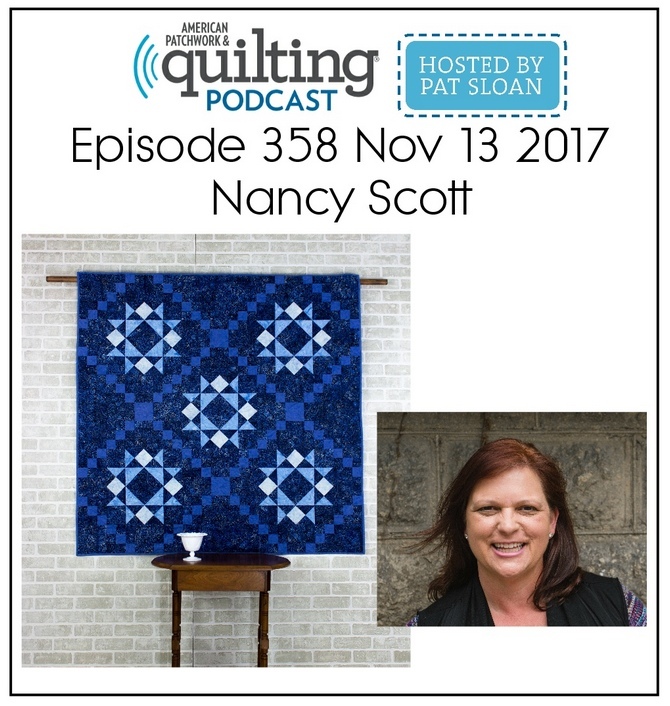 Earlier this week I was a guest on the American Patchwork & Quilting Podcast hosted by Pat Sloan. You can listen to the podcast as we talk about why I like teaching online classes. And yes, without technology, we wouldn't have online classes, Facebook Live or any of the other video options that we have come to expect. I talk to a lot of people who are hesitant about taking an online class for a variety of reasons. I love them not only as an instructor but also as a student. 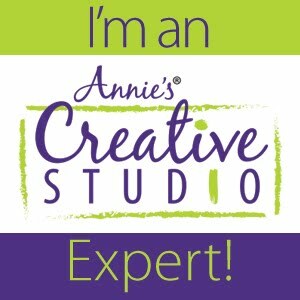 You can see all my online classes available through Annie's Craft Store. They are all professionally produced and some are even on sale right now! Even though technology can be a big pain in the "you-know-where" some days, it is part of our lives and it is here to stay. So we can either reject it, accept it or be thankful for it! I choose Thankful! 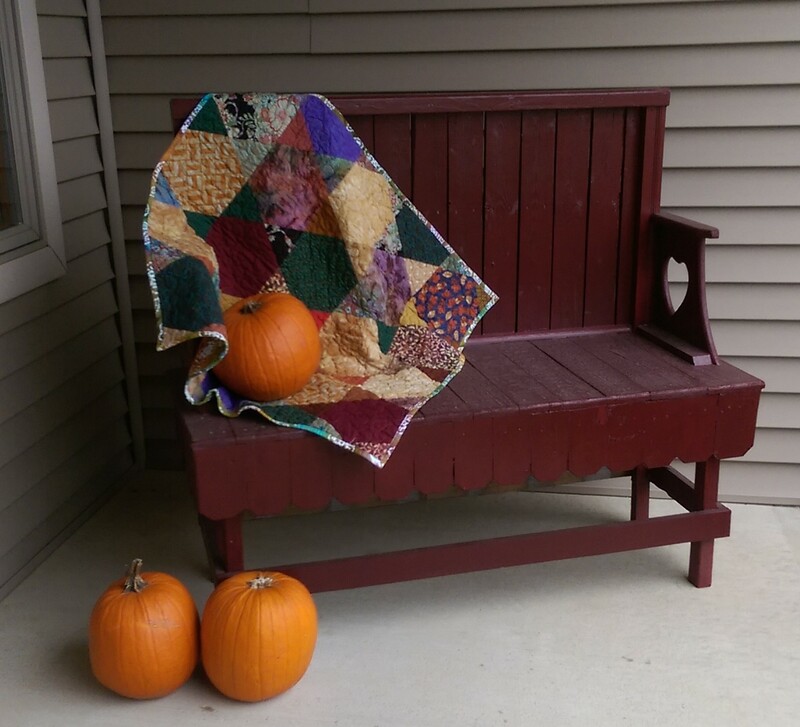 I'm mixing things up this month and am writing a series of Thankful Thursday posts - some will be "quilty" and some will not. 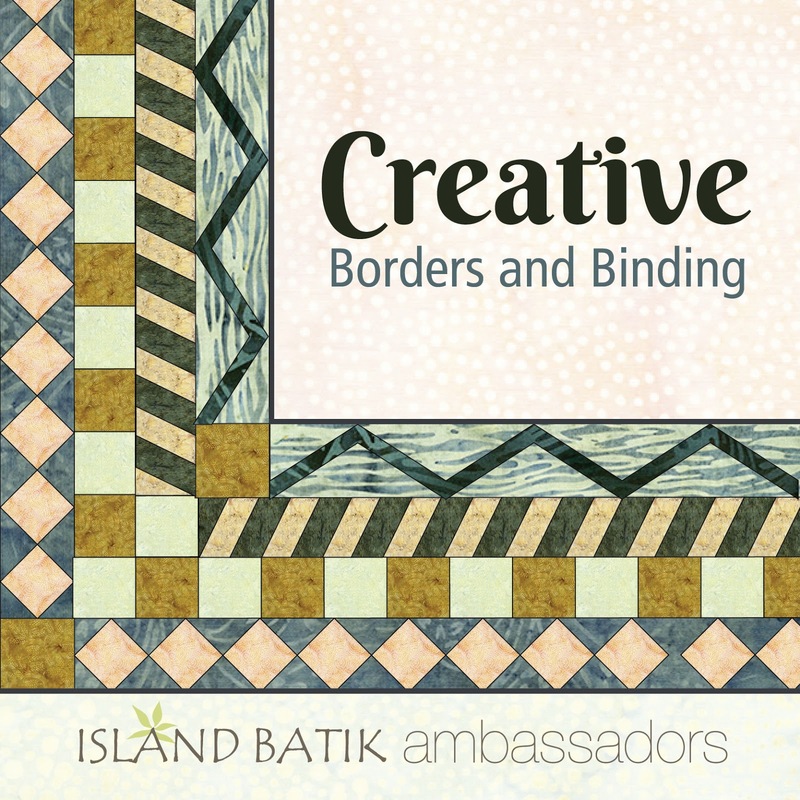 This week I want to share how thankful I am to be working with Island Batik as one of their Brand Ambassadors this year. This is an amazing experience. Not only do I get to work with beautiful fabrics, but it has challenged me as a designer to create outside of my usual style ... and we all know, when you are out of your comfort zone, that is when personal growth occurs! And for that, I am thankful! I'm also thankful for all the other designers I have met and now become friends with through this ambassadorship. I always get a lot of questions about what does a Brand Ambassador do? 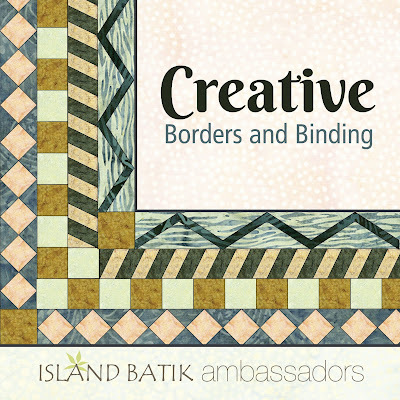 We aren't employees or independent contractors for Island Batik but we work with them to promote their beautiful fabric collections. 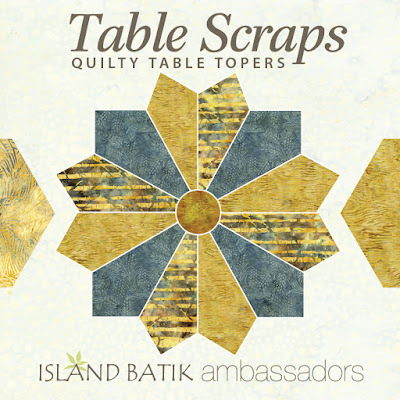 Twice a year Island Batik gives me the batik fabric that I used to make these projects as well as other projects for independent patterns as well as magazine and book submissions. Here is a quick look at three of my favorite projects I have made as a Brand Ambassador. Early in the year I made the Blossom wall hanging and you can read more about it. This wall hanging really kicked off all the raw edge fusible applique projects I have designed this year - which has been a good thing! 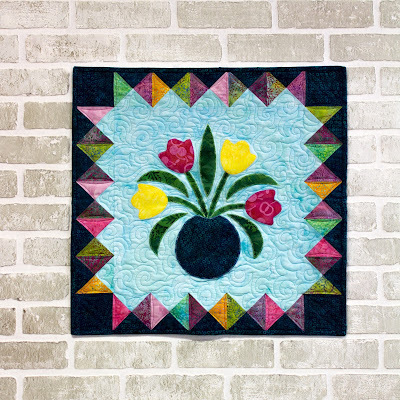 The pattern for Blossom is available as a pdf download on Craftsy. Another of my favorite projects was my Rory Baby Quilt pattern made using Island Batiks. I don't know which version I like best - the original or the remake? You can read more about Rory here. The pattern for Rory is available pdf download on Craftsy. My absolute favorite quilt so far this year was made using my Black & White Express pattern but changing out the fabrics to Island Batik's Sakura Collection. My Back to School blogpost gives you all the details. Again it's a toss up whether I love the original or the remake better. 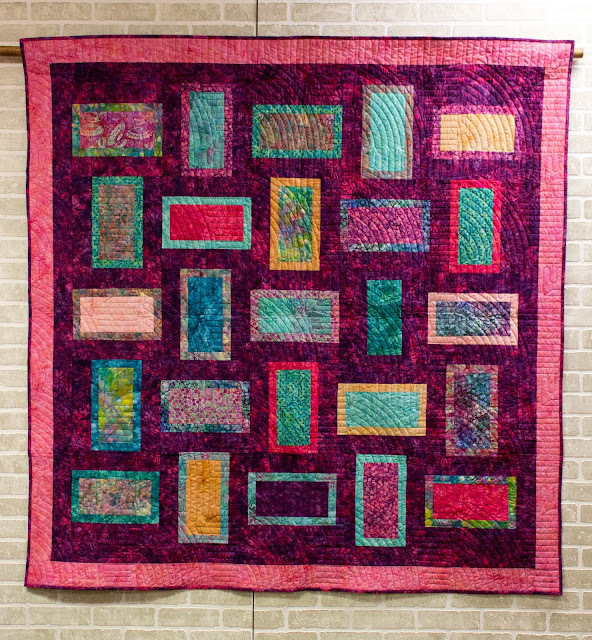 The batiks lend so much color to this quilt and just make it so bright and cheery! I hope my Thankful Thursday posts have inspired you to take some time to think about all the things that you are thankful for too! Have a great week and I will see you back here next Thursday! I just wanted to quickly let everyone know that I will be hosting a 13 week Quilt-A-Long using one of my latest patterns ... The Simple Sampler. 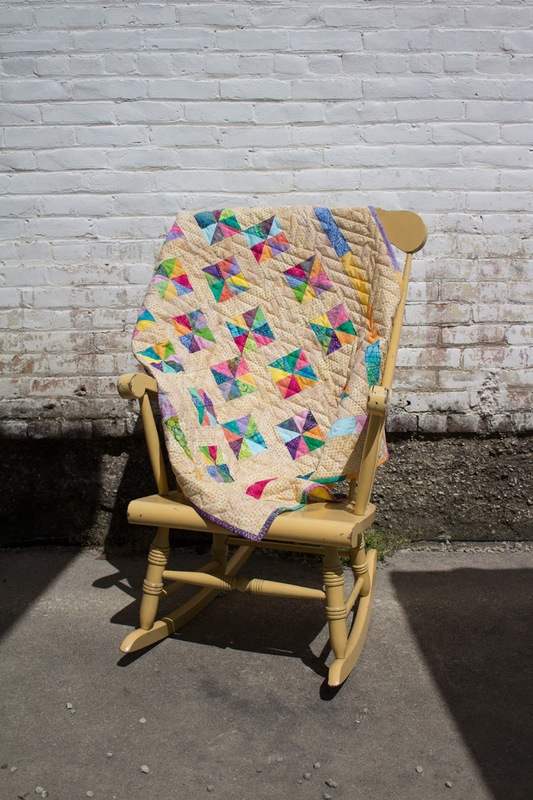 I've given it a lot of thought and I will NOT release this pattern for sale until after the Quilt-A-Long is over, so this is your chance to get it first and it will be FREE to you! The Quilt-A-Long will run 13 weeks, 1 week for each of the 12 blocks and 1 week for the sashing and borders. It starts the week of Sunday January 7, 2018 and concludes on Saturday April 7, 2018. 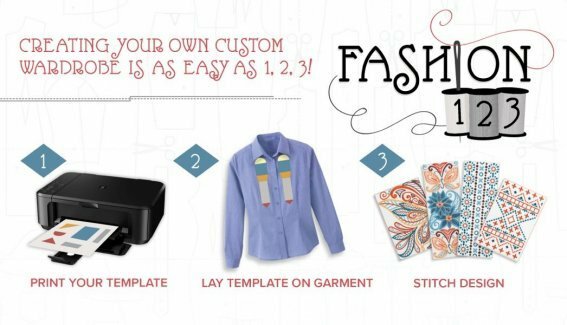 Each week you will receive full color instructions including drawings and / or photos PLUS a weekly FB Live or video that talks about the block and how to make it. 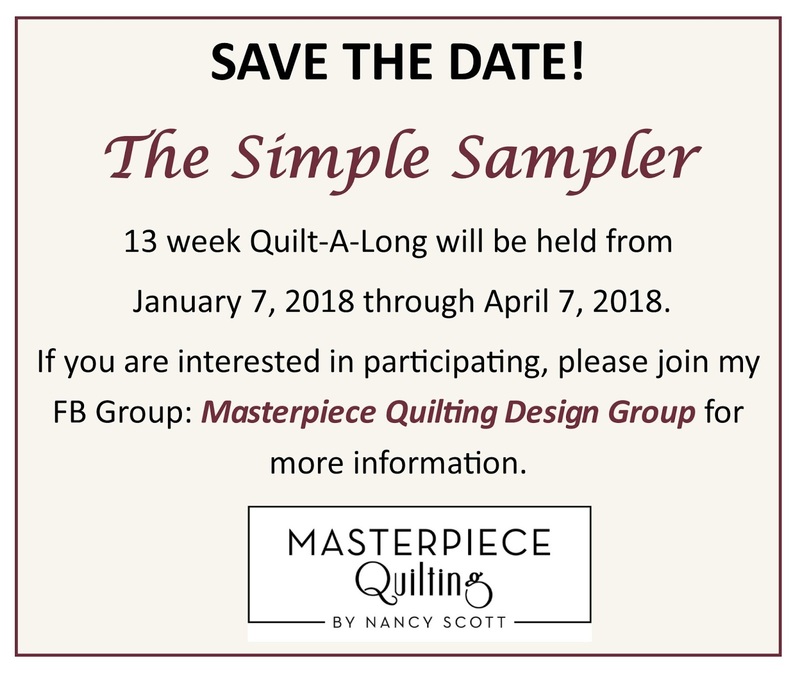 The Quilt-A-Long will happen in my FB Group: Masterpiece Quilting Design Group, so be sure to join the group if you want to participate or get more information. There are a multitude of things in life we can be thankful for. It's pretty easy to categorize these things - family, pets, friends, health, job, a place to live. Sometimes it gets a little harder when we try to narrow down to specifics. Sometimes it takes a conscious effort to be thankful. If you are inclined, write them down. I normally do my "thinking" time while I'm driving, so that makes it a bit more challenging to wield pen and paper. But writing them down makes it easy to review, reflect and redirect our thoughts on those days when we feel less than thankful. After a while your brain will catch on to being thankful and it will become easier to be more specific. In no time, you will be counting your blessings everyday. October's Island Batik challenge was exactly that - a challenge ! I frequently design quilts with out borders so this challenge left me a little stumped.... I've done elaborate pieced borders before but it took a while to get my design creativity wrapped around this one! 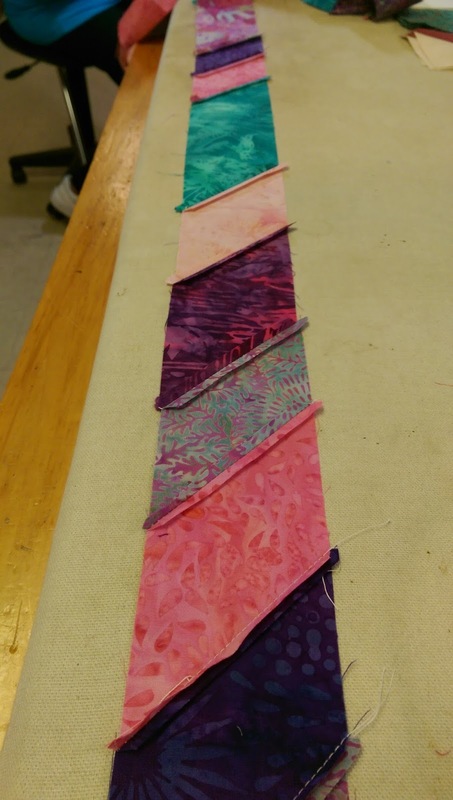 I started by sorting through the Island Batik fabrics I had available....which was a whole lot of scrappy pieces - so how about a scrappy border? I sorted them into lights and darks since they were from several collections. I came up with this really cool design, I sketched it out on graph paper and everything was ready to go.... and everything was ready to go.... except me ... I just didn't LOVE the design. I know that sounds so corny - but it seemed forced and every time I started to work on it... I just couldn't. So without further adieu .... 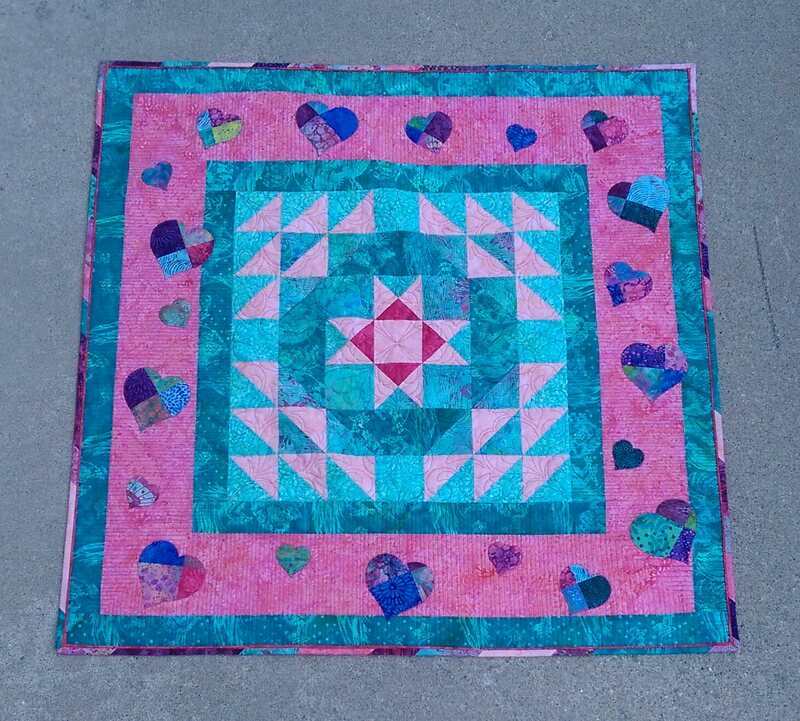 I present my Broken Hearts Quilt! The binding is a pieced binding made from lots of small pieces - you know I said I had lots of small scrappy precuts strips. 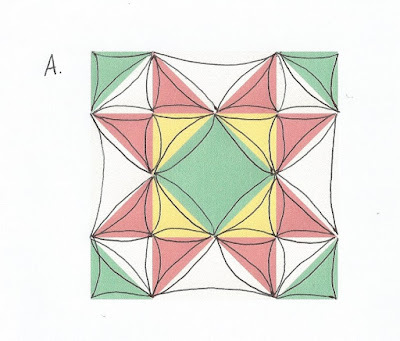 I saw this technique on a competition quilt this summer where the quilter used really small - like 1" - long pieces so the binding looked like striped fabric. I used slightly longer pieces but the concept is the same. 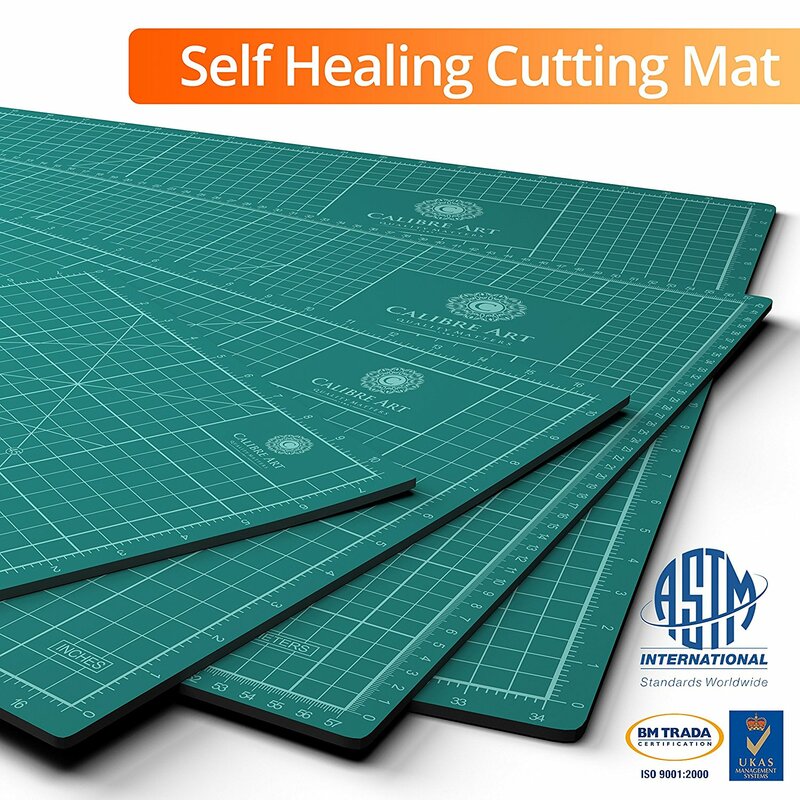 This technique results in a bulkier, thicker binding due to all the seam allowances. I trimmed each mitered seam to a scant 1/4" and pressed the seam allowances open, making sure to trim the dog ears. I used 2-1/2" wide strips to help accommodate the extra bulk. Next time I might try 2-3/4" so I have a wider binding. I think it turned out pretty cool. What do you think? It has lots of possibilities such as using smaller pieces like the inspiration quilt or using one color with little bits of a second color randomly placed for accent. Next is the bright pink flange. I frequently add a flange before binding to add a bit of color at the edge of the quilt. This time I used a corded flange for added dimension. I cut the flange at 1" width and pressed it half lengthwise. I inserted the cord and used the adjustable zipper foot that came with my new Brother sewing machine to baste the cord in place. Now onto the quilt top. 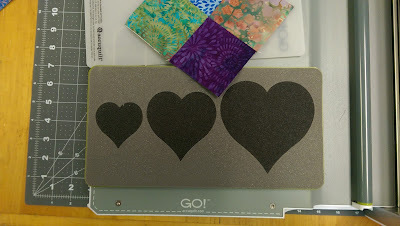 I have three individual borders which measure 2" - 5" - 2" with floating hearts raw edge fusible appliqued across them. The part from my jottings was making the appliques not from a single piece of fabric but from pieced fabric. Since I was testing this out - I wanted to make it as simple as possible (remember - I'm on a deadline here !) so I cut my appliques using an AccuQuilt die cutter. 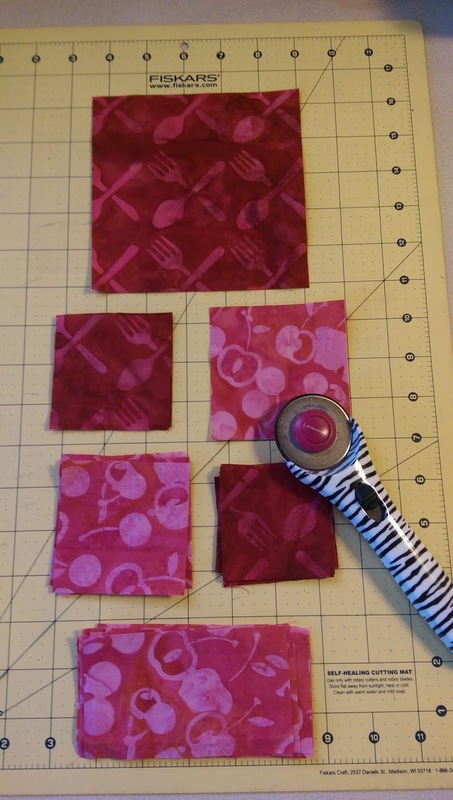 I grabbed some of my scraps and cut them into 3" squares and stitched 4-patch units. Next I fused Steam-A-Seam 2 fusible interfacing from The Warm Company to the wrong side. I ran them thru the die cutter which made quick work of cutting all the heart shapes. 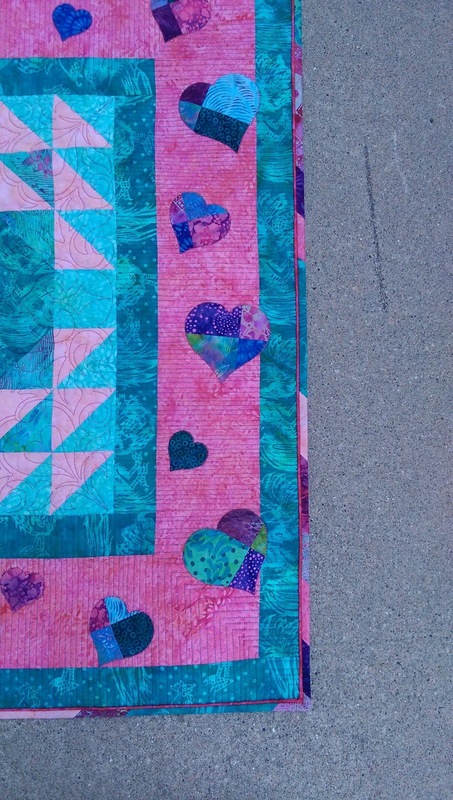 After fusing, I machine appliqued each heart in place with a contrasting color of Aurifil thread. 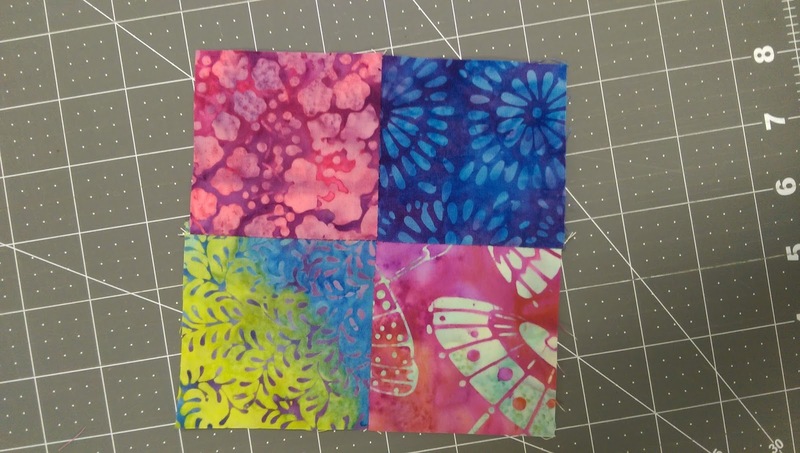 I want to try this technique again using improv piecing and then cutting my shapes. 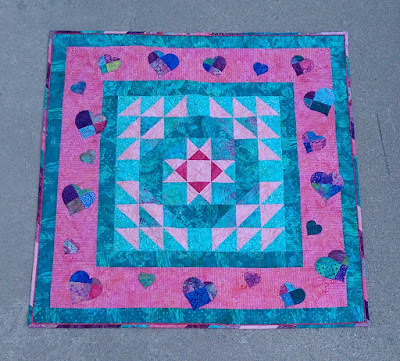 I think it will result in a crazy quilt look - which I love and will take advantage of some of my smaller scrap pieces. It might be fun to add decorative stitches too! 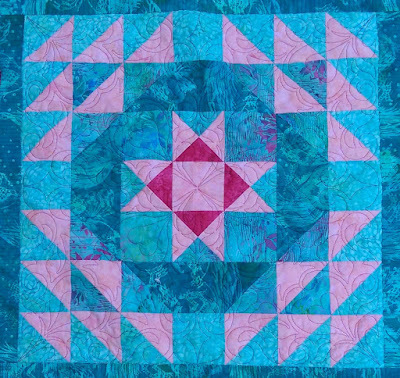 Moving inward to the center section of the quilt, I have a 9" finished star block surrounded by two pieced borders that build off the center block. Wow - that's a lot of borders and binding options for you! Let me know which one you like best... Leave a comment and be sure to follow me on IG @masterpiecequilting and like my Facebook page. 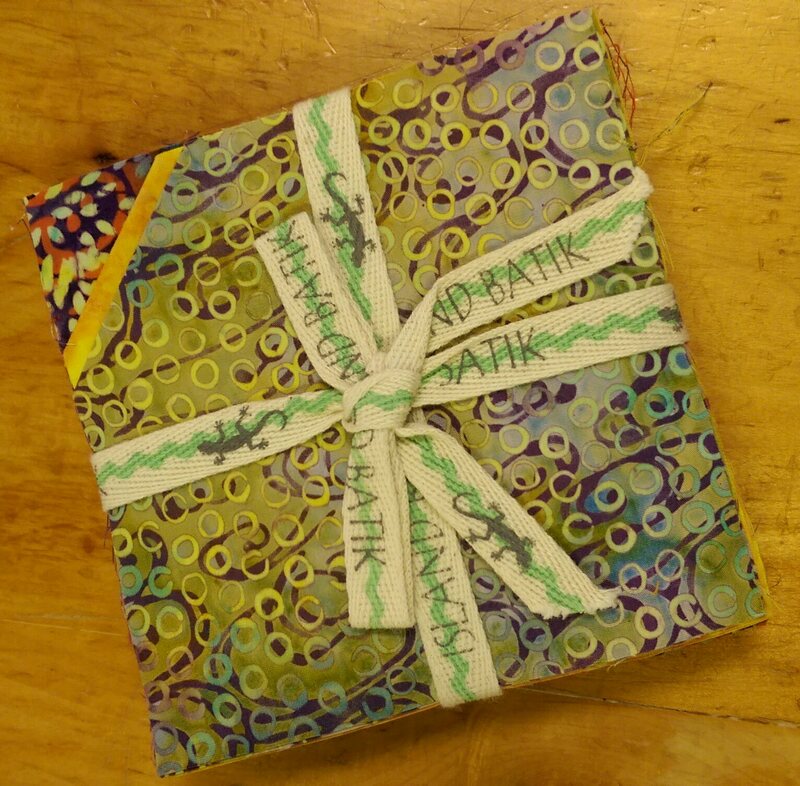 I will select one lucky winner on November 1st to received this bundle of Island Batik precut 5" squares. 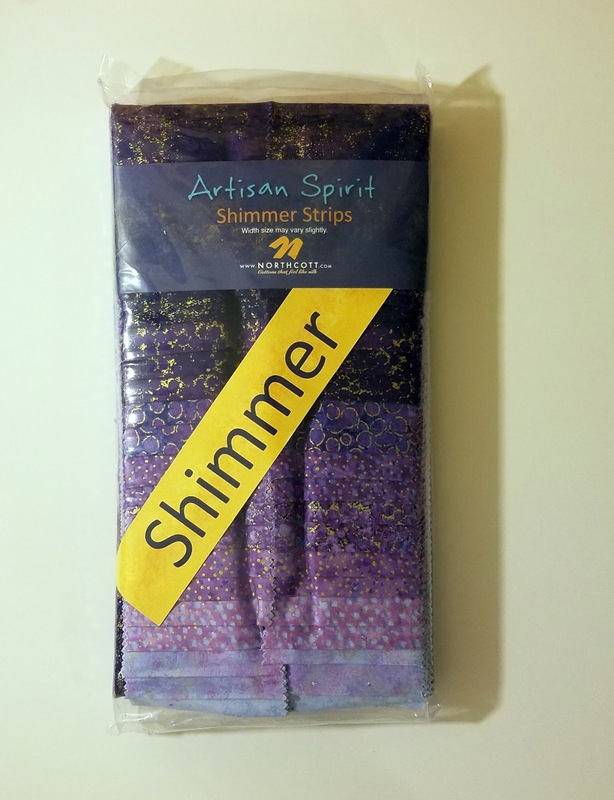 Labels: 2017, AccuQuilt, Aurifil, batiks, Brand Ambassador, Island Batik, Masterpiece Quilting, Steam-A-Seam 2, The Warm Company. Hi! Welcome to Masterpiece Quilting! The last few weeks have been super busy with the Christmas Caroling Row Along. I have absolutely enjoyed reading everyone's blog and seeing the rows they have designed. If you want to read more about my row, it was the Jingle Bells Row. As we wrap up the Row Along I want to share the blocks that I made. There were so many gorgeous rows, it was hard to make a decision which ones I wanted to make. Some of the rows are vertically oriented while others are horizontal so incorporating them together into a quilt took a little bit of work and several versions on draft paper. I decided to add a pieced center block to pull everything together. Here is a photo of the completed quilt top. I still need to quilt and bind it. To make it easy for you to make your own quilt, I'm providing a free pattern for the Christmas Caroling Row Along Finishing Layout as a pdf download on Craftsy. 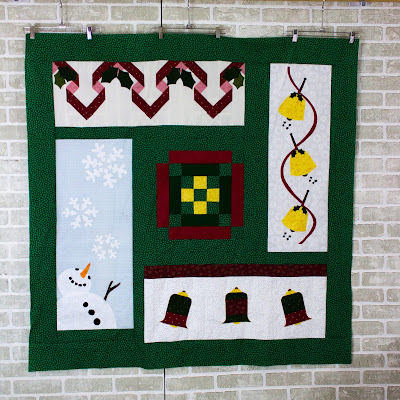 The Jingle Bell Row I designed is available for $5.00 as a pdf download on Craftsy and is the outer border for my Jingle Bells Quilt pattern which is available for just $5.95 thru October 31 on Craftsy. 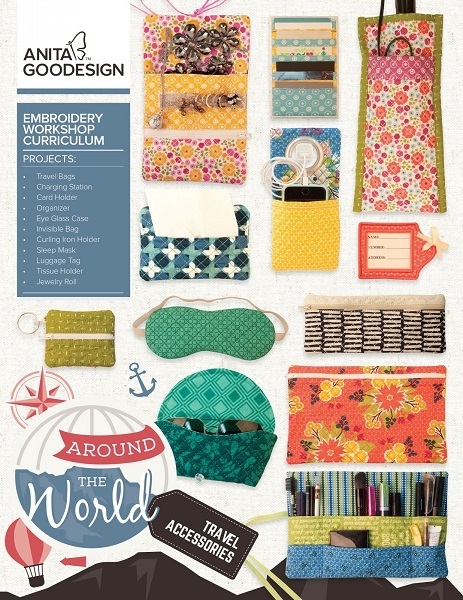 To enter the Amy Bradley giveaway, please enter here. 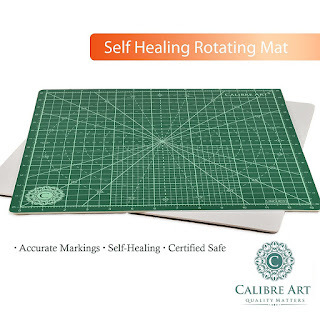 To enter the Calibre Arts giveaway, enter here. You’ll have to visit the blog or the featured blog to enter the giveaways. Not all giveaways can be entered at Seams To Be Sew. I will start announcing winners on September 12, 2017, and finish announcing winners on October 12, 2017 with the exception of the Calibre Art giveaway, those will be available after each featured day, starting September 06, 2017. Most of the giveaways are international shipping this year in some cases, you will be asked to pay for shipping your giveaways. I am not rich and I do not ask sponsors for money, they provide prizes only. If they shipped the prize to me, you will be asked to pay for shipping. All giveaways will be shipped that are in my home within 48 hours of my having heard from you. It's always a fun day at the studio when quilts come back from the publisher! The process for having a quilt published in a magazine can easily take 6 - 12 months from when the call for submissions is received, preliminary designs are submitted, accepted contracts are signed, the sample quilt is made, instructions are written, everything is submitted to the publisher who then edits, photographs, lays out and prints the publication. Wow, that's a lot of steps and I'm sure I have forgotten some! And during this time, the project is on the hush-hush ... which is why so many designers post "secret sewing" photos of random blocks with the promise that it will be really cool when it's done. It's why when someone pops into my studio, I warn them with "you don't really see that quilt on the wall!" 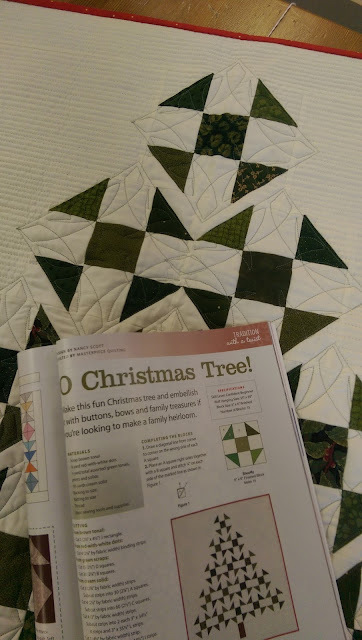 Earlier this week, my Oh Christmas Tree wall hanging came back from the publisher. The pattern is the Winter 2017 issue of Quilter's World magazine which is arriving in mailboxes and hitting the newsstands right now. The quilt is playful twist on a traditional quilt block - my favorite thing to design! And is a perfect way to use up some stash greens. I hope you enjoy it and I would love to see the version you make of it. Making Connections Blog Hop - You Voted & Here are the Results + A Give-A-Way ! 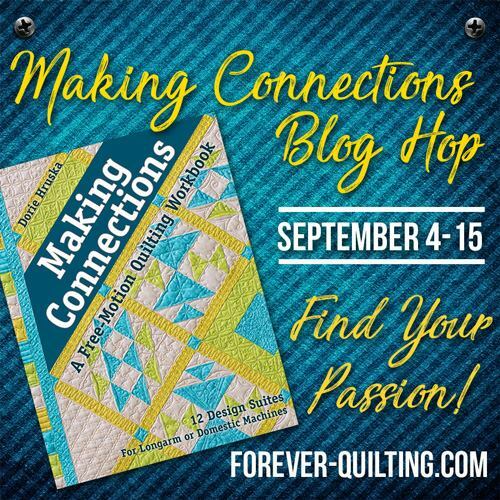 A few weeks ago I was honored to be part of the Making Connections Blog Hop to celebrate the release of Dorie Hruska's new book: Making Connections: A Free-Motion Quilting Workbook with C & T Publishing. You can connect to my original post here and learn about the voting that I asked the readers to participate in to help me select a quilting pattern and thread color for my table runner. Well, I've tallied the votes. On the thread - it was a landslide victory for So Fine 421 gold thread. 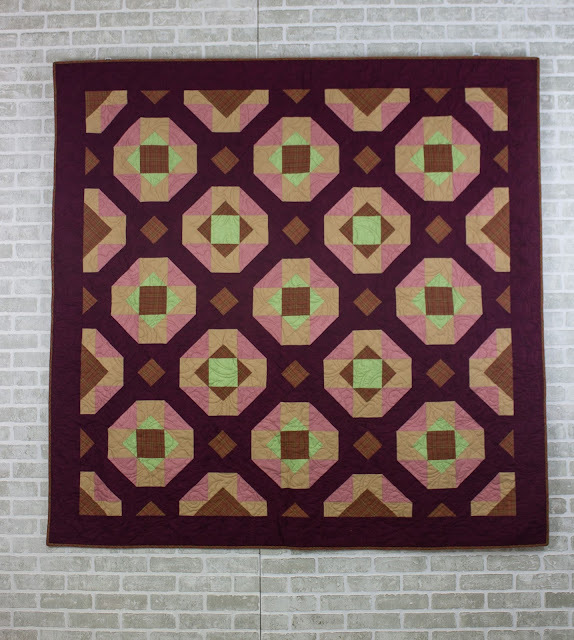 But on the quilting pattern voting, it was a neck-to-neck or should I say stitch-to-stitch finish! Option A won by just a few votes over Option C.
I used my longarm to complete the quilting and here's a photo of the quilted block. I just love it! Don't you? 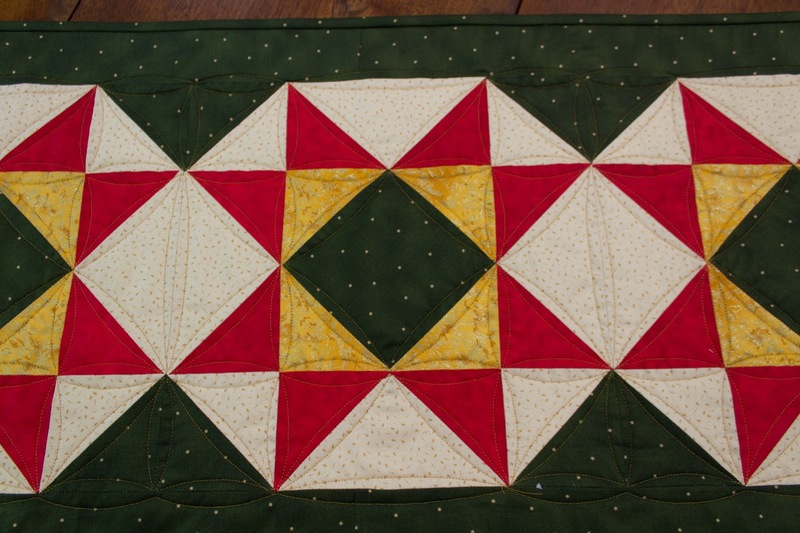 I love the nice even consistency the quilting gives the table runner. I'm kinda picky (well, maybe obsessed) that table runners lay flat ... after all, they will have dishes and vases and candles and such sitting on them and we sure don't want those falling over! Here is a photo of the completed runner. 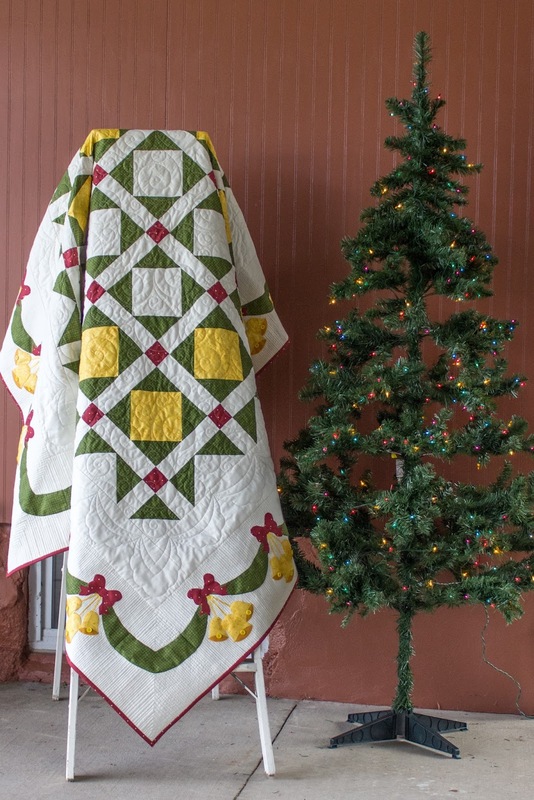 The quilting is a perfect compliment to my Let's Gather pattern and showcases the fabrics beautifully. And, if you have read ALLLL the way to the end of this post, as a thank you to everyone who followed along with the blog, I'm giving away a free PDF copy of my Let's Gather pattern. Just leave a comment below and be sure to like my Masterpiece Quilting FB page. The calendar has made it official - it's the first day of Fall. However it sure doesn't seem like it in Northern Indiana as our forecasted high temperature for the day is 90 degrees. I thought it was supposed to be hoodies and bon fire weather ! In the meanwhile, let's talk about your Fall décor. I know many of you already have your pumpkins and mums bought. I tend to wait because I want them to last into November and hopefully through Thanksgiving. Yep, I'm old school - no Christmas décor until after the Turkey has been celebrated! 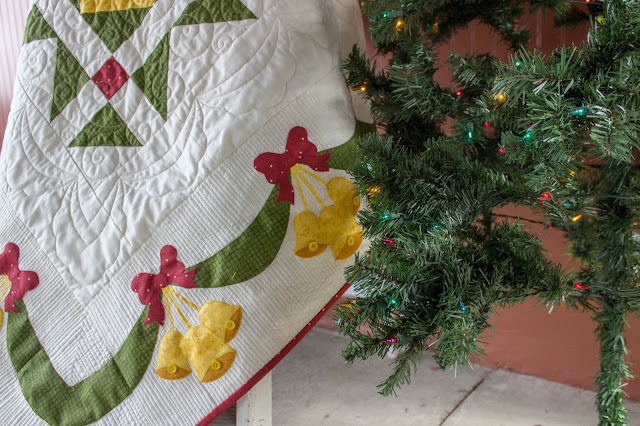 But what about your quilted décor? I normally start with the table and the dining room. I take off the patriotic table runner that I use from Memorial Day through Labor day and replace it with a fall runner. 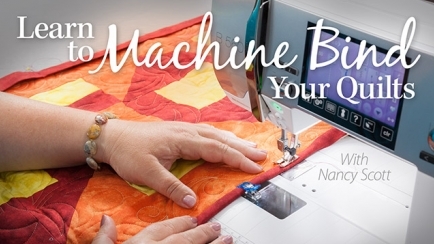 This particular runner is from my Learn to Machine Bind Your Quilts video class. I haven't decided for sure which quilts are heading to the couch but one of my favorite new designs is my Autumn Bliss quilt which is full of rich color. It looks like it would be hard to make - but it's really pretty easy. Another favorite is my Sunburst Strips & Squares quilt. 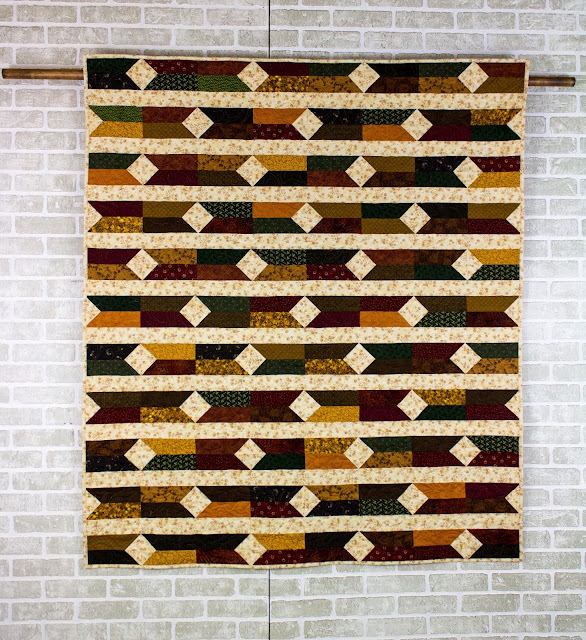 This version features a beautiful palette of fall colors and it's super simple to make with a roll of precut strips. And we can't forget outside too... This is the décor at my Mother's house. A simple big hexagon throw made with scrappy fall fabrics along with some pumpkins too. I would love to hear about your fall decorating plans. Leave me a comment below about how you decorate for Fall and next Friday, September 29th, I will choose a lucky winner for a free Autumn Bliss pattern. Happy Decorating! I'm Nancy Scott & I'm excited to part of this elite group of bloggers bringing you the Christmas Caroling Row Along. 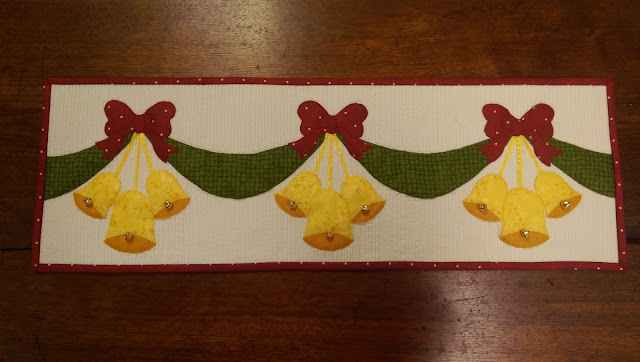 One of my favorite Christmas Carols is Jingle Bells - so I used it as the theme for my row. Jingle Bells Row is available on Craftsy for $5.00. I designed an entire quilt with my Jingle Bell row as the outer border! 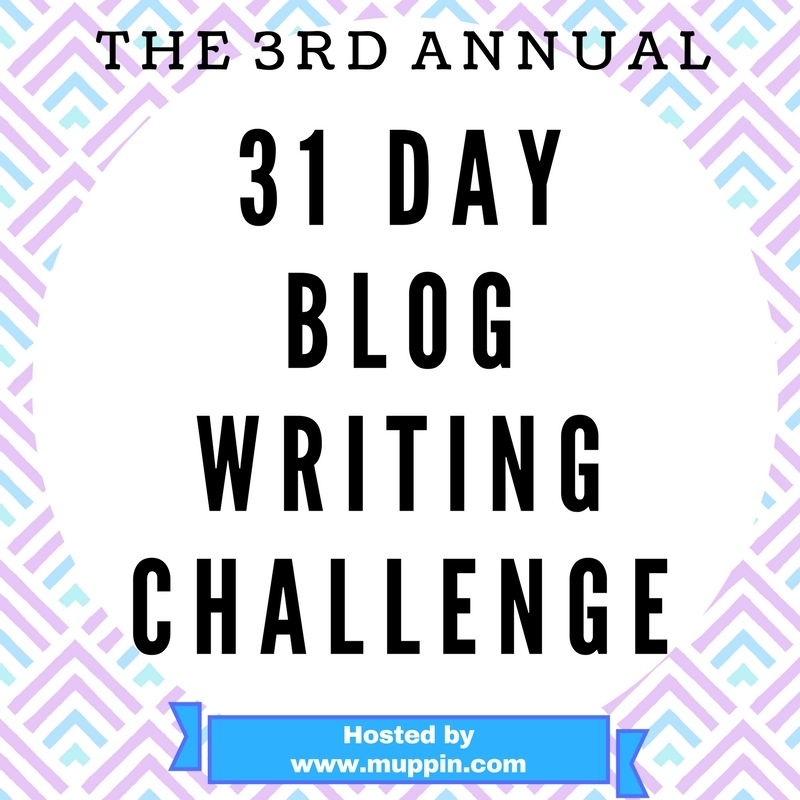 And what's a blog without giveaways! 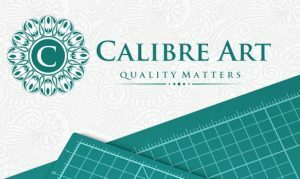 I'm pleased to have Anita Goodesign, Calibre Arts and Northcott Fabrics sponsoring these giveaways! Thank you for stopping by and visiting my blog. Be sure to visit the other bloggers participating in the Christmas Caroling Row Along. I've seen previews of many of the rows and they are simply beautiful! Labels: 2017, Christmas Caroling Row Along, Jingle Bells, Masterpiece Quilting, The Warm Company.